On Saturday mornings, I get to visit one of my favorite places: the local farmer’s market. Walking down the wide aisles of the market, looking through the baskets of fresh produce from local farms and the cheese and dairy and bread from the other stands, is inspiring and refreshing. It’s hard to explain why this ritual brings me so much joy and inspiration. Maybe it’s the fresh food? Maybe it’s the community aspect? Maybe it’s the fresh air and getting out of the house? Maybe it’s all of the above. One of the beautiful aspects about shopping at a farmer’s market is being able to experience the seasonal shifts in produce. It’s hard to get in a rut when it comes to produce. As soon as you fall in love with tomatoes, the season ends and it’s time for a new veggie to take center stage. Some veggies stick around much longer, and others have a very short seasonal window. 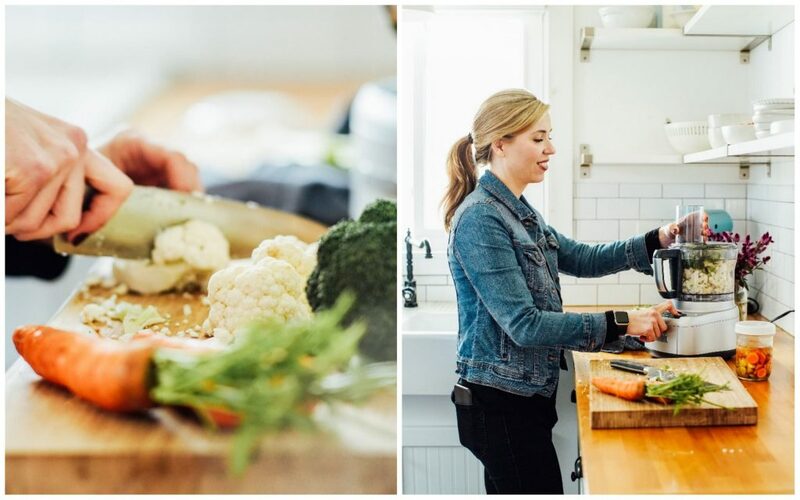 It can be challenging to know what to do with some veggies, or just how to use common veggies in different ways to avoid boredom. To solve this issue, our local farmer’s market has a chef booth positioned near the produce tents. The chef booth features a new recipe each week, made from the ingredients on sale at the market that week, mainly seasonal veggies. I loved the sample so much, a vegetable fried rice made with seasonal veggies, micro greens, and cooked rice, I came home and attempted to recreate the sample for dinner. My re-creation was a success. Even the kids raved about the fried rice and didn’t even question the green specks. Let’s talk about the base of the “fried” rice. 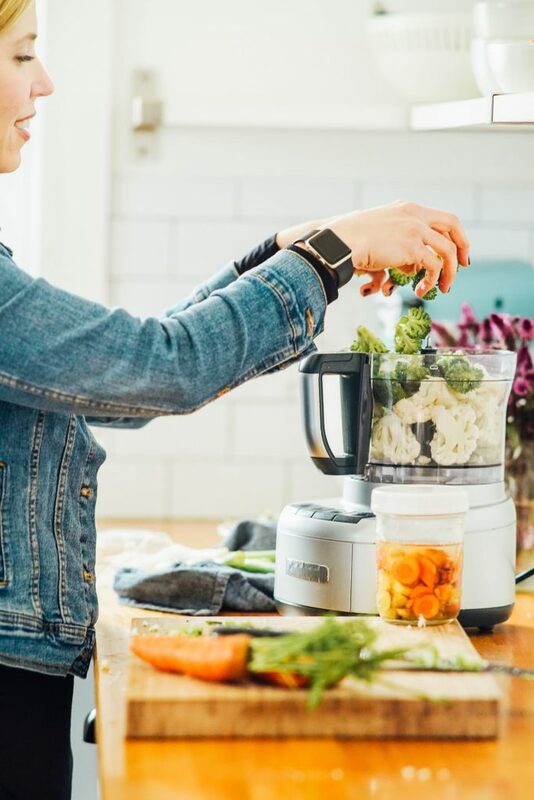 The veggie base is made by pulsing broccoli and cauliflower crowns in a food processor. Now, if you want to save time you could use packaged cauliflower or broccoli “rice.” Many stores now sell this in the produce and freezer sections. 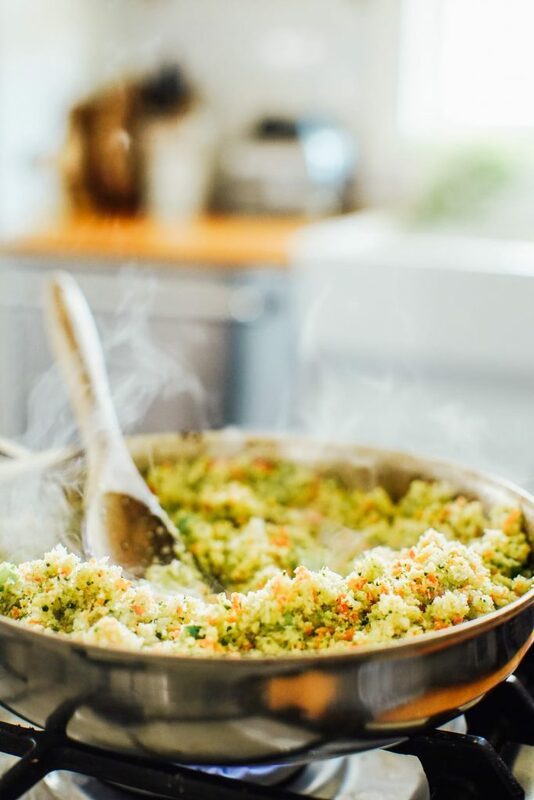 Once the broccoli and cauliflower resemble “crumbs” or “rice,” it’s time to sauté the mixture with oil and add a few more veggies and then finally cooked rice. 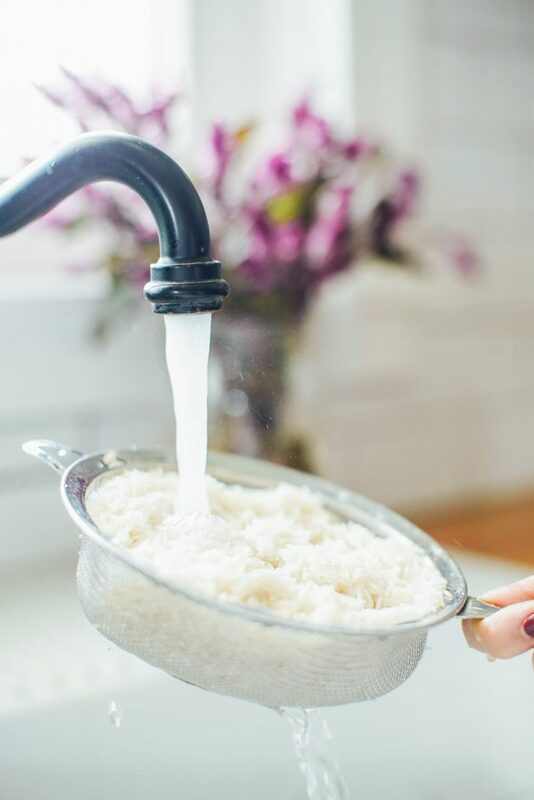 For the rice, you can either cook the rice on the stove-top or in the Instant Pot while the broccoli and cauliflower are prepared, or if you’re looking to save time cook the rice in advance and store it in the fridge. 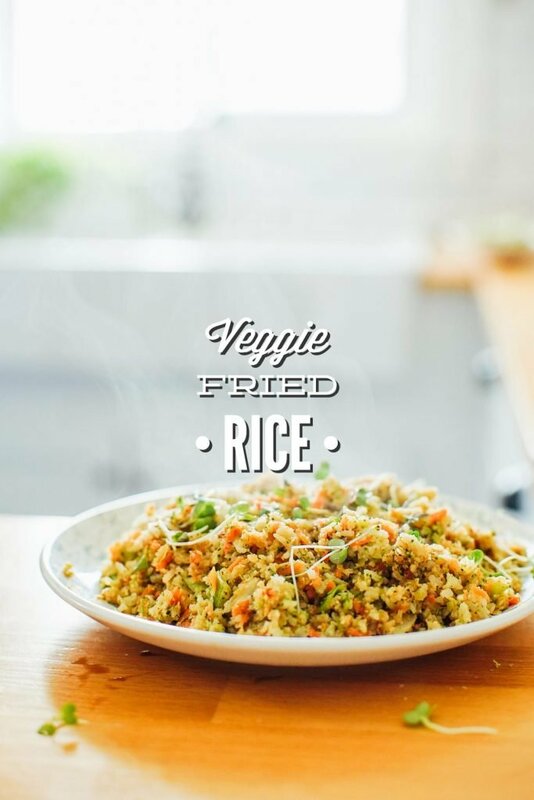 The end result is a veggie-packed “fried” rice that’s made with simple, seasonal, fresh ingredients. Serve the rice as-is or alongside chicken, shrimp, salmon, or soft “boiled” Instant Pot eggs (as pictured). 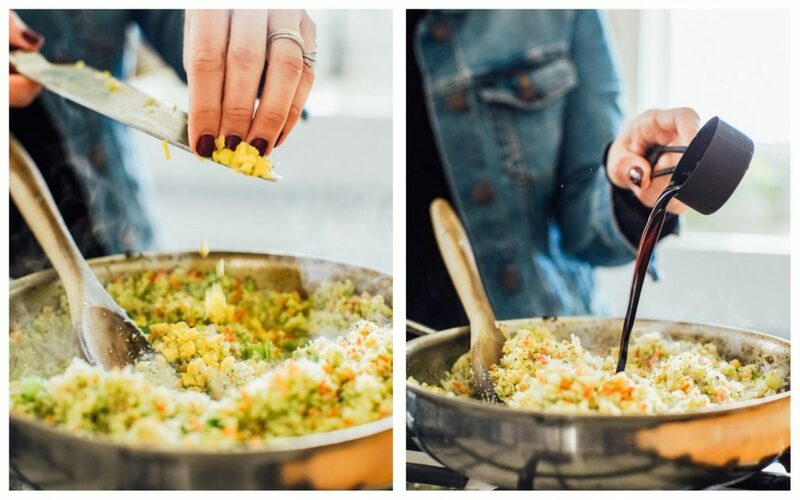 Another great option is to scramble an egg before cooking the veggie and rice mixture, set it aside, and then add the egg to the final fried rice. If you can’t consume eggs due to allergies, the egg option won’t work. 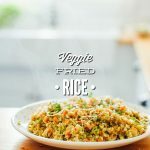 I added “egg-free” to the title because I know how hard it can be to find an egg-free “fried” rice recipe, and there are folks in the community with egg allergies. If you’re looking for a make-ahead lunch option, fried rice is a great option for the lunchbox. Scoop the rice into meal prep containers and add sliced chicken or an avocado (cut in half and add lemon juice squeezed over the top–don’t add avocado until the day you enjoy the rice), and you’ve got yourself a nourishing, ready-to-go lunch! Or, store the rice in a large container and add it to a school lunchbox or thermos. 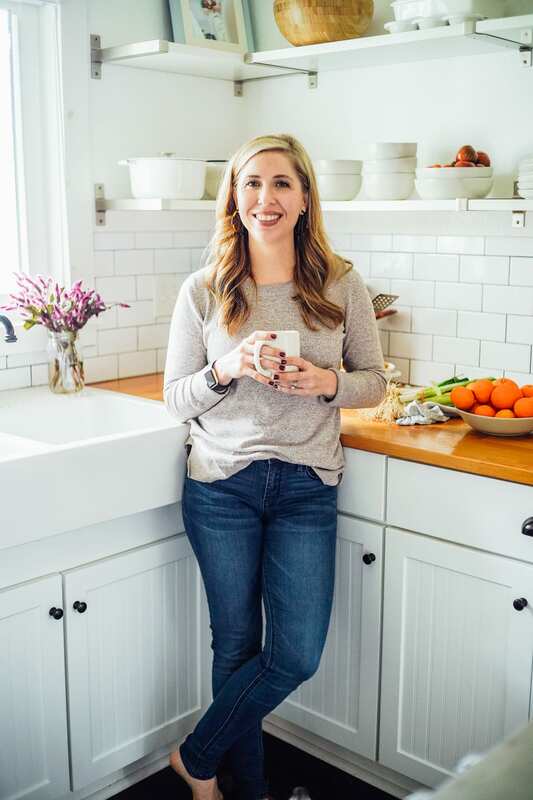 The fried rice may be enjoyed at room temperature, warm in a thermos, or reheated on the stove-top or in the microwave. Since the rice is on the wetter side, it reheats well. 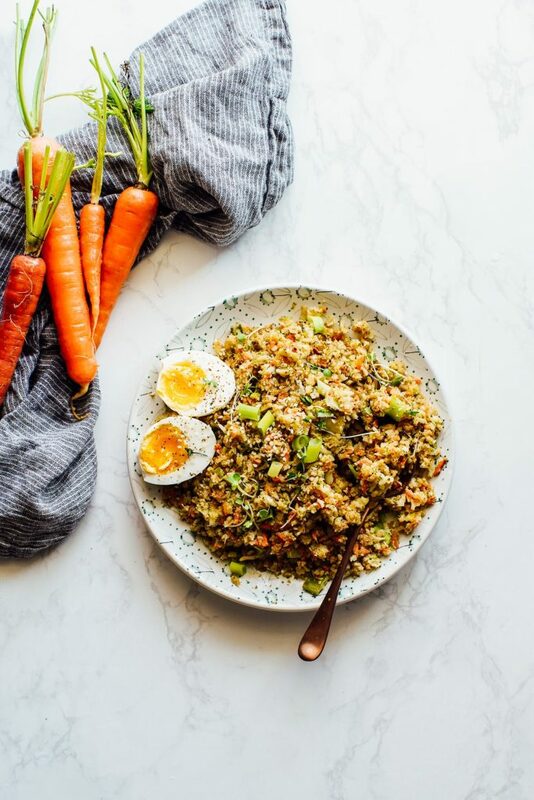 A veggie-packed fried rice made with cauliflower, broccoli, carrots, and your choice of rice. Make-ahead friendly. Vegetarian. Kid-approved! Cut the broccoli and cauliflower crowns into chunks. (You can also use the stem of the broccoli in this recipe.) 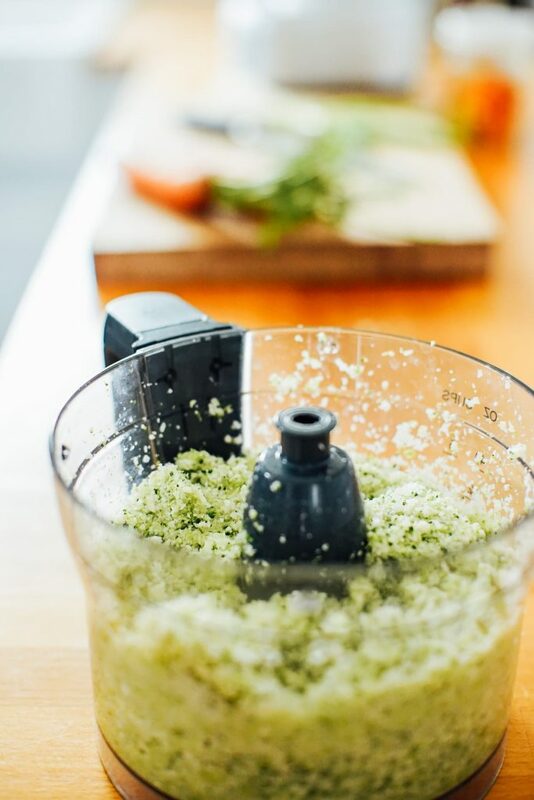 Place the chunks in the bowl of a food processor, and pulse on high until the veggies look like "rice" or crumbles. Depending on the size of your food processor bowl, you may need to work in batches. I usually have to work in batches of 2-3, pouring the "riced" or crumbled veggie into a separate bowl before adding more chunks. Add the oil to a large skillet. Place the skillet over medium-high heat on the stove-top. Once the oil is hot, add the riced/crumbled cauliflower and broccoli. Stir the veggies to keep them from sticking to the skillet. 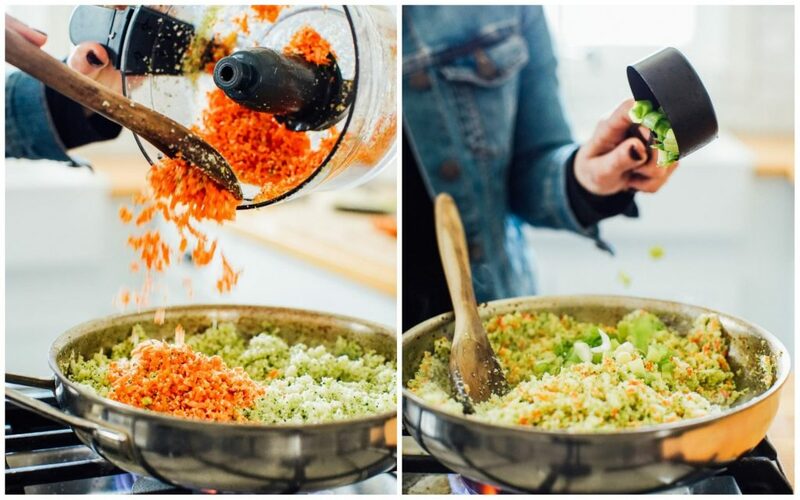 While the veggies cook, shred the carrots in the food processor (if using whole carrots versus pre-shredded carrots.) Add the carrots to the skillet. Sauté the veggies for about 8-10 minutes, stirring every couple of minutes to prevent the veggies from sticking to the skillet. If you need to, you can add a bit more oil or reduce the heat. Add the sliced minced garlic, ginger, and green onions. Sauté for another 3-4 minutes, until fragrant, stirring as the spices cook to incorporate them throughout the veggie mixture. Stir in the cooked rice. Add the tamari sauce, stirring until absorbed by all the veggies and rice. Finally, stir in the pea shoots (or greens of choice). Serve warm, or store in meal prep containers for future lunches (or dinners) or a large storage container. The rice will keep in the fridge for 4-5 days. *If you don't have fresh ginger, I would try 1/2 teaspoon ground ginger. **For the rice, follow the directions on the package. I like to use white basmati rice. I use 1 cup of rinsed rice (rinse the rice in a sieve under fresh water for a couple of minutes). Add 2 cups of water, the rinsed rice, and 1 teaspoon oil or butter with 2-3 pinches of salt to a saucepan. Bring the rice to a boil, covered, and then reduce to a low simmer and cook until the water is absorbed for 15-20 minutes. Day-old rice works very well in this recipe, as well as freshly-cooked rice. You could probably use cooked quinoa as well. The tamari sauce should provide enough saltines to the dish so you won't need extra salt. If you taste the rice and feel like you need salt, add it at the end. If you're grain-free or don't want to use rice, you could skip this ingredient. I would also cut down on the amount of spice used (garlic and ginger) and tamari sauce. I’m guessing you add the cooked rice after the tamari and before the pea shoots? Hey Tamara, You’ll add it after the seasonings. Then add rice and tamari to coat. Just updated. You could also add it after the tamari–there’s really no way to mess up. Thanks for catching that! Thanks so much! I made it this morning and it was surprisingly delicious! I’m not a huge cauliflower fan but can definitely hack it in this recipe. Thanks for sharing! Awesome, Tamara. I’m so glad you enjoyed it!